Gray smudges of cloud moved back in on Saturday, shedding brief raindrops, but for a change I didn’t mind. I reveled instead in a lush landscape that filled the near distance. Everywhere was green. Green new leaves with crisp new veining. Rich green grass that overtook the moss while we weren’t looking. Our back yard and everything around is suddenly bursting with new growth. You see, the sun finally came out in Seattle last week. For three glorious days everyone and his brother came out to play. Runners and cyclists jostled for position with the swarms of walkers at Green Lake. Sun worshippers perched like flowers with faces angled to catch the rays. Metal tables emerged from back rooms at restaurants just in time for the lunchtime crowd and were occupied before they could be set. And in true Seattle style there were sunshine slowdowns on the freeways. There was a collective sigh of relief as the mercury pushed past 70 for the first time in ages. Hours later, however, the temperature dipped as the clouds crept in. On Sunday, I ignored the weather and had a splendid time waging the Battle of the Spinach Balls. While the rest of Seattle shivered, I deconstructed an old recipe from the Main Line Cookbook that my sister’s been making for 25 years. Whistling happily, I pulled out half the fat and some of the carbs to bump up our favorite green stuff. As I popped my first attempts into the oven, the maple trees on the back porch nodded their leafy limbs in approval. By the third or fourth batch, even my wife the Salad Queen forgave the weather gods and pitched in with advice. Here’s what we learned. To keep its shape, a good spinach ball can’t be too large. For best texture, it needs just the right balance of stuffing mix, spinach and cheese. To hold it all together, you can’t stint on the egg. Finally, for best flavor, you need just the right amount of salt. Our winner is a spinach ball with caramelized onion and feta cheese that tastes nearly as good at room temperature as it does fresh from the oven. Stuffing mix note: You can use Pepperidge Farms herbed stuffing mix for this recipe or make your own. I made stuffing mix from three-day-old bread by cutting the loaf into ¼” cubes, spreading the cubes onto cookie sheets, topping them with herbs, salt, pepper and a drizzle of olive oil and baking at 300° for 25 minutes, tossing halfway through. Before adding to the recipe, I pulsed the cooled stuffing mix in a mini-prep blender for 5 seconds. Thaw the Spinach: Thaw a 16-ounce bag of spinach at room temperature for 2 hours. By the time you use it, it should be mostly thawed but not dripping. Partially caramelize the onion: Melt butter and olive oil in a 12” frying pan. Over medium-high heat, sauté 6 ounces finely chopped onion for 5 minutes, stirring as necessary, until onions are sputtering and beginning to brown at the edges. Lower the heat to a simmer and sauté for 5 more minutes until onions are translucent. 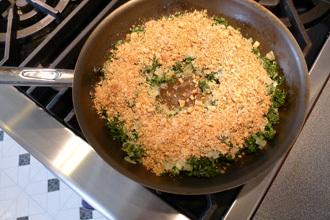 Make the Mix: Remove pan from the heat and toss the spinach in with the onions. Break up any lumps of spinach. Add the stuffing mix, cheese, pressed garlic and herbs and toss together. Whisk eggs in a small bowl and add last, binding the mix. Remove to a bowl and, for best results, refrigerate for an hour or two before shaping the balls. Bake the Balls: Preheat oven to 325°. Lightly grease a cookie sheet with olive oil. Form balls that are a little over an inch in diameter and set them onto the pan so that they’re not touching. Bake for 40 minutes, turning twice during baking for even browning. If the balls want to stick to the pan, let them cool for 2 or 3 minutes before slipping a spatula under them. You can serve these hot or cold. The recipe my sister swears by, Hot Spinach Balls by Joanne Feehery Duffy, can be found in Philadelphia Main Line Classics (Copyright 1982 by The Saturday Club and Favorite Recipes Press). Many thanks to Joanne for leading the way. If you have a similar recipe or variation, please feel free to share it in the comments below. We’d love to hear about it! Hasn’t the weather been strange and awful lately? I have never heard of spinach balls before. These look and sound wonderful. Sounds like a delicious way to get your veggies! These sound great. I’ve never heard of such a thing. My favorite part is that the spinach only needs to be 1/2 thawed. Since I never plan ahead properly I’m always trying to throw stuff together last minute. I can partially thaw spinach. 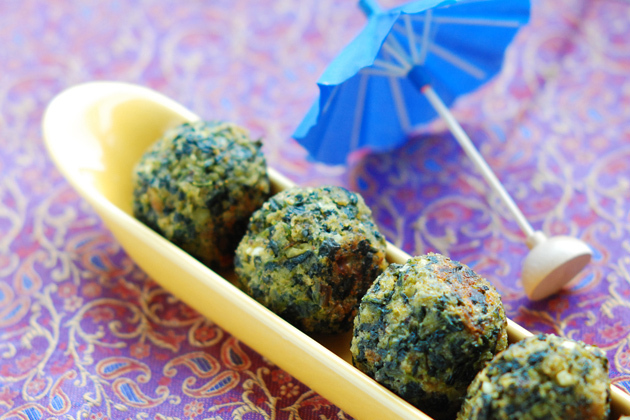 Those original spinach balls have been making the cocktail party rounds here for years! I love your adaptations…so delish! 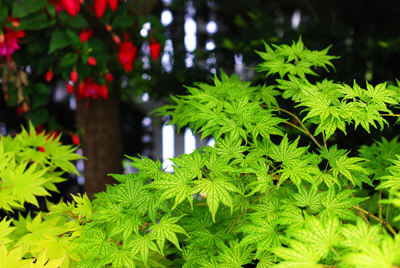 Your Japanese Maple looks like it’s a beauty. We have three and a laceleaf we bonsai’d in the backyard. They’re so beautiful…I bet they do well in Seattle. By summer’s end, the deliciate leaves burn due to the high temps we have here. We love the Spinach Balls. It seems like a healthy and rich appetizer. Being in Napa, we understand taking advantage of the sunshine. 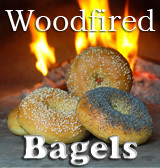 I would love to make these and serve them with our 2009 Sauvignon Blanc, or drizzle some Three Hoots Olive Oil to finish. I love all that you’ve put in those spinach balls! They sound delicious! This is a recipe I will try for sure. I love the fact that in the ingredients our Greek feta is included!! As your neighbour to the north, I concur that our May has not been up to the usual standards we expect here on the temperate west coast. The sun has definitely been shirking it’s duty lately! Wow back in 1986 I think it was the first issue of Cuisine magazine. There was a recipe for Spinach Balls which my mom made quite often. I have to find and now! For some reason I think she boiled hers… Must go searching…. spinach, stuffing and feta?!!! Whay have I never heard of this? THANK YOU! We are not fans of feta cheese, could we substitute another cheese? I’m cutting this recipe in half so how much spinach would I use? 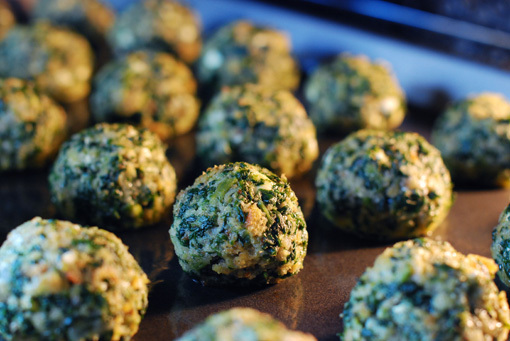 Spinach balls remind me of my childhood during the holidays…I made your recipe tonight and they’re in the oven, I can’t wait to eat them! Pinned this to my board “recipes”. 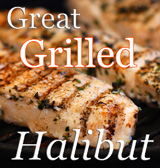 Thanks for sharing, will definately be making these tonight for dinner. Ive made spinach balls for years but never thought of adding feta! Going in blind on this, but am using you recipe for an appetizer this Christmas! Im sure they’ll be great! Like the idea of caramelized onions…add a bit of sweet to the savory.